April 9 – Moves to hold African football chief Ahmad Ahmad to account following a string of damaging corruption allegations appear to have been blocked by his own inner circle. Insideworldfootball has seen correspondence circulated to all members of the region’s executive committee disclosing that a request for the growing scandal to be placed on the agenda for this week’s meeting in Cairo has been rejected, further underlining the deep divisions within African football’s leadership. FIFA have still to respond to a March 18 enquiry from Insideworldfootball as to whether its Ethics body has opened an investigation into the allegations of corruption that have swirled around Ahmad. Last month, the lid was lifted on Ahmad’s empire of allegedly corrupt practises with this website reporting that he was being accused of contract fraud, mismanagement of CAF funds and the payment of $20,000 sums directly into the private bank accounts of federation presidents. 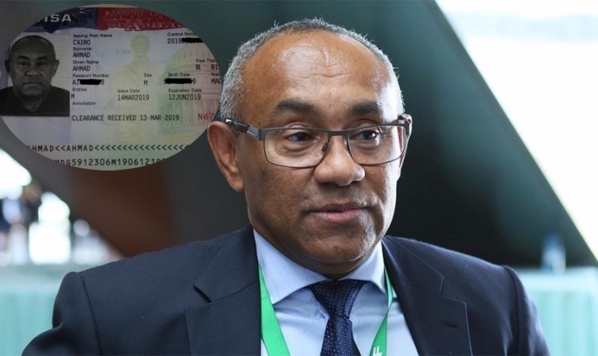 (See: Lid lifted on CAF boss Ahmad’s empire of corrupt deals and bought officials). Insideworldfootball saw documents detailing a sports equipment offer in December 2017 for the African Nations championship (CHAN) from Puma for €312,000 that was dropped in favour of a $1,195,603 deal for exactly the same equipment to be bought via French company Tactical Steel. Further documents showed a wire transfer of $20,000 from CAF in Egypt to the personal account Mario Mendes dos Reis Semedo, president of the Cape Verde FA, apparently one of many transfers to CAF bosses; as well as a list of muslim African FA presidents who were invited to make the Umra (a pilgrimage to Mecca in Saudi Arabia) during Ramadan in 2018 with all the expenses paid by CAF at a cost of $100,288. The emails, letters and documentation suggested a trail of governance and integrity breaches and now a request by former Liberian FA boss Musa Bility to have the matter addressed at this week’s CAF executive committee, of which he is still a member, appear to have been brushed aside. Bility, who resigned in February from two senior CAF posts in protest over how Ahmad handles the management of African football, has already written two explosive letters to the Confederation of African Football’s (CAF) executive committee (exco) saying CAF risked becoming the “subject of ridicule around the world” because of Ahmad’s alleged abuse of office. Bility has history himself when it comes to transparency having been blocked from standing for the FIFA leadership in 2016 after failing an integrity check. But, he says, some of Ahmad’s decision-making, not least rejigging the Africa Cup of Nations hosts for the 2021, 2023 and 2025 tournaments and the signing of a commercial deal with a betting company, needs to be more strenuously scrutinised. Sources close to CAF says this means almost certainly reporting his own confederation president to the FIFA ethics committee. It is no co-incidence that the general secretary of CAF, which is based in Cairo – the site of this week’s meeting – is Egypt’s Amr Fahmy, one of Ahmad’s closest allies. It is understood Fahmy would be responsible for drawing up the agenda but that Ahmad would have final approval. “If an exco member asks for clarification by putting a topic on the agenda, the general secretary cannot of his own volition say no,” said Bility. Further pressure on Ahmad is mounting over unconfirmed reports that he has dispensed with the services of Sara Kamel, who is understood to have worked in the president’s office. It is not known why Kamel, who is still believed to be at CAF in an as yet unassigned role, was let go amid unsubstantiated rumours about the reasons.